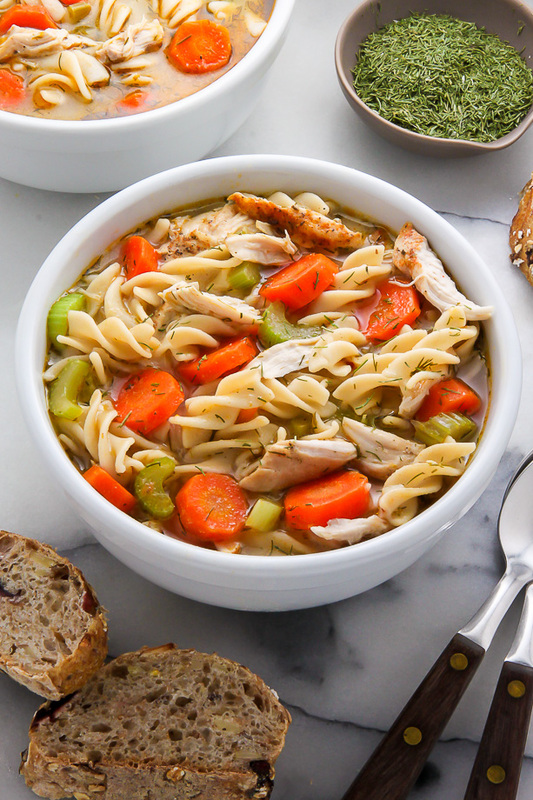 This recipe for Flu Fighter Chicken Noodle Soup is the ultimate comfort food when you’re feeling sick! 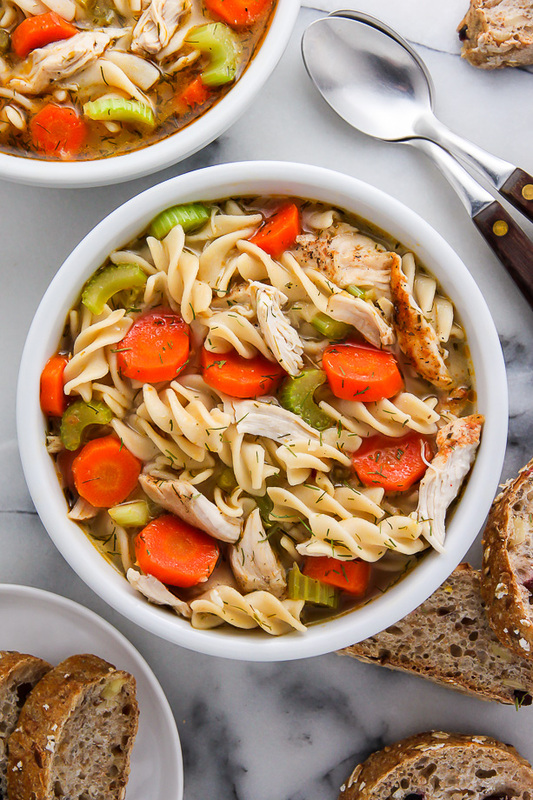 Loaded with tender chicken, carrots, celery, onion, and a flavorful broth, this is the best chicken noodle soup for colds! Loaded with good for you ingredients and full of flavor – this absolutely delicious Flu Fighting Chicken Noodle Soup is winner all around!!! When it comes to soup, I’m kind of an old pro. I grew up an avid a soup lover. I have my mother to thank for that. The instant I displayed even the slightest symptom of a cold, she was there, with tea and toast; or gatorade and pizza (she swore by this for upset stomachs! ); or my favorite, ginger ale and chicken noodle soup. I grew to love this soup and soda ritual so much that I brilliantly (ha) began to fake random illness just to get the royal treatment. It worked about twice before she caught onto my little theater charade and, after a firm talking to, taught me to make the soup my damn self. Best gift ever. This soup is so healthy, bold, and flavorful I could truly be content eating a heaping bowl for lunch every single day. To be honest, most Winter afternoons, I do. It’s a great way to get my daily dose of meat and veggies and comfort in one convenient, cozy bowl. I like my soups to be nice and chunky, with a bold, flavorful broth. Sounds easy… right? But alas, achieving the perfect broth is an art that can take many a’ pots of soup to perfect. I finally found mine in this soup. I use a combination of (store-bought) chicken stock and water, and it really turns out lovely. Now, you may be thinking how in the world does stock and water make a dreamy broth… right? Well, that’s where our veggies, citrus, and herbs enter the story. Garlic, onion, fresh dill, and the juice of a whole lemon. They make this soup sing. I know the dill may seem a bit oddball for chicken noodle soup, but trust me, chicken+lemon+dill —> they are meant to be together!!! I used 100% whole grain pasta noodles, farmers market fresh carrots, and a handful of celery we’ve had hidden in the back of the fridge for who knows how long. The results? A soup that knocked the last bit of flu out of my life for good. 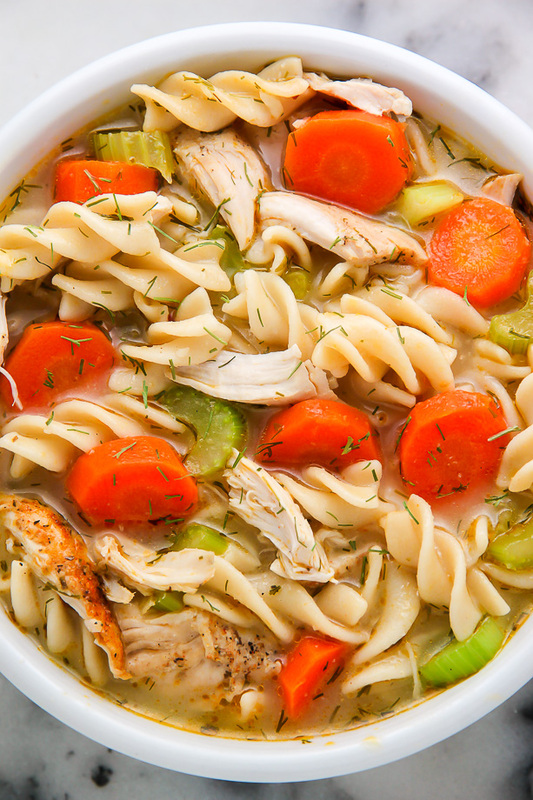 This Flu Fighter Chicken Noodle Soup is powerfully delicious. Got a cold? 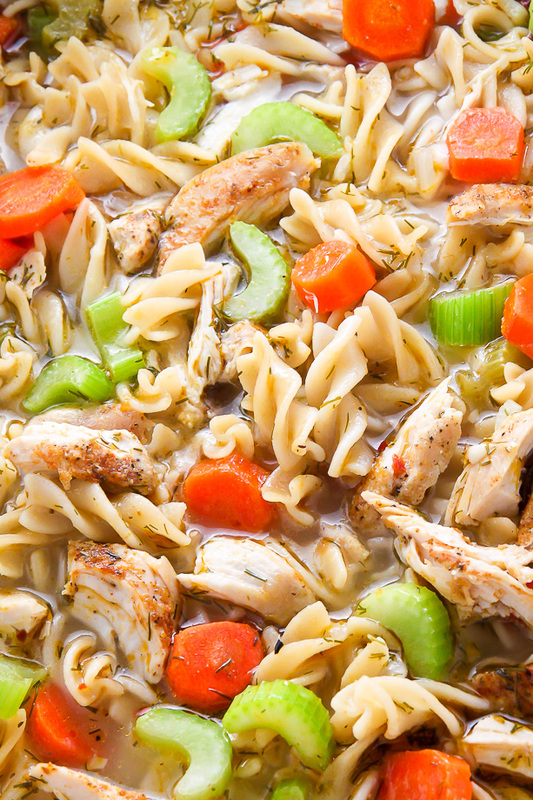 Then you need to try this Flu Fighter Chicken Noodle Soup! 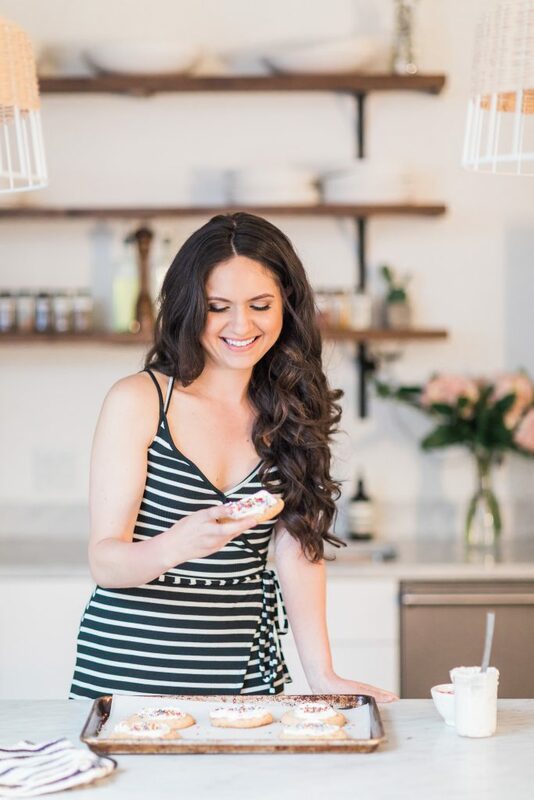 It's packed with healthy ingredients and it's absolutely delicious! Heat olive oil in a large, heavy bottomed soup pan over a medium flame. 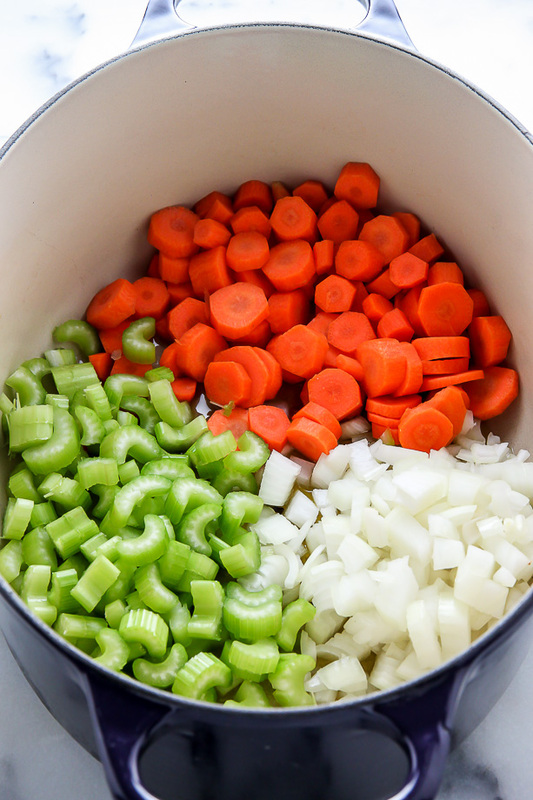 Add carrots, celery, and onion, and cook - stirring occasionally - for 8-9 minutes. Add garlic and salt and cook for another minute before adding the bay leaf, water and chicken stock. Increase heat to high, bring soup to a boil, then reduce heat to medium-low, stir in noodles, and simmer for 10 - 15 minutes, or until the vegetables are soft and the pasta al dente. Stir in cooked chicken, dill, and lemon juice. Taste soup to adjust seasonings, then serve at once. What a gorgeous looking soup! Sick or not, I’d slurp down this whole bowl in a flash! Mmm this looks so hearty and good! My boyfriend’s mom is Jewish, and always makes the best chicken noodle soup! But this version looks delicious too! Love this! Roasting the chicken is the key! I still make my own stock makes a big difference but do not use the poached chicken. Any ideas for the leftover poached chicken? Yes take the chicken and grind up the meat add mayo,onion, and sweet pickle relish. Mix well and you have a wonderful chicken salad to enjoy at your leisure. Try it with Ritz crackers,and or butter crackers. Pizza for an upset stomach? Your mom is the best! Love how chunky and hearty this soup looks. For some reason I can’t see the recipe/ingredients? Help? Hi Theresa. There is a link to the original recipe in the last paragraph of the post. Do you see it now? I can’t find the recipe either…..sure wish they would make it easier to find a printable recipe!!!!!! No, the link takes you to a different soup. It is the same soup. Just new photographs. Hi Leslie. Click over to the actual recipe (link in post) and you can read comments there. The citrus is not strong, it just gives the soup a brightness I find lovely. Do you mind if I ask what spices and herbs you roast your chicken in? This looks amazing! a little to Blah for me.. Well just the broth the chicken was on point! I put more cumin and more bay leaf plus two chicken bullions to add flavor to the broth! Other than that I was greatness thank you! When you click on the link in the last paragraph, it takes you to the recipe for “OUR FAVORITE CHICKEN NOODLE SOUP. LIKE… EVER.” Is there a different link to the recipe for this soup? Or are they the same recipes? Thank you! This soup looks so delicious!! I am having trouble finding the recipe for the soup. Can you please help? I just made this…OMG the flavors are amazing! 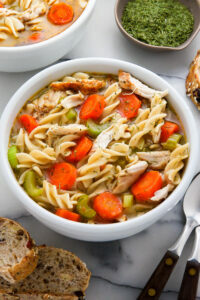 Best chicken noodle soup recipe hands down! Of course I have to season to my liking and needed to add of few of my Louisiana spices to make it really pop with flavor! This absolutely is the best chicken soup we’ve ever had! I added more lemon juice and that’s it – ! Hi Mendi! I’m so happy to hear it 🙂 I also always add a little extra lemon juice; it adds an extra dose of flavor pep. This soup saw my family through two bouts with the flu this year so far, and I must say, it’s a keeper. You have converted me not just to adding lemon juice to chicken soup but to cooking my chicken this way for any soup ever. I threw this seasoned, roasted chicken into tortialla soup (so good! ), chili (also good! ), and chicken and wild rice soup (delicious!). I seriously doubt that I’ll braise chicken in the broth again any time soon. Thanks for the awesome recipe! Hi Audrey. I just went to the post and it linked to the page a-ok! Can you try again (it’s in the last paragraph)? It may have just been an issue with your internet connection. Let me know if you still can’t get to the recipe and I’ll retrieve it for you manually. when i clicked the link the recipe it shows has no lemon juice or dill. am i seeing the wrong recipe? or did you tweek the one that is there? I did not find the chicken noodle soup recipe. Can you send it to me. Hi Juliana. Thank you! You may use a photo as long as you properly credit it and link directly back here for the recipe 🙂 Have a great day! Hi Bev. As noted in the post, please click the link that will take you to the original recipe (titled our favorite chicken noodle soup). I can’t find the link to view recipe. Where is the last paragraph to click on???? It shouldn’t be made so hard to get the recipes if your sharing. Hi Beverly, it is says “for the recipe, click here”… it is the last sentence of the post. I did not think clicking a link would be hard. The pictures are different at the actual recipe site. There is no bay leaf listed in the ingredients and chili powder and cumin are not included in the directions. Did 2 recipes get mixed together? Hi Patricia. I’m not sure what you are confused about. As stated in the flu fighter chicken noodle soup post, you need to click the link I included which will take you to the original recipe: our favorite chicken noodle soup. The photos look different because I have evolved in photography since I originally posted the soup, and also because I chose to chop my carrots larger – that’s it. As for the ingredients you don’t see, I have just reread my post and all of the ingredients listed are called for in the method below. When you cook the chicken, it asks you to sprinkle to spices, which include the cumin and chili powder. And the bay leaf is called for when you add the chicken stock. I hope that helps clear things up for you. Thank you so much, Amaryllis! I will send your sweet compliment over to my mom – she will be thrilled. Thank you for letting us know you enjoyed the soup. Haha – that is awesome! Thank you for letting me know, Felicity. So happy to hear it, Alicia! I love the dill too, and now I can’t imagine making my chicken soup without it. Next time I will cut down on the lemon…it really drowned out the flavor of the stock. But otherwise I enjoyed this and will make it again. I’m making this (again) tonight but using turkey stock instead 😀 definitely one of our favorite dinners!! I love the idea of using turkey stock! Great! I hope you enjoy it, Denise! Couldn’t find the recipe. Would you please send it to me. There is a link (in large print) at the end of the post. Just click on it. This soup looks awesome! Very excited to try making it. You’ve stated that the recipe is at the end, in large print, and in pink….I can’t find it. I’d love to make this soup! I’ve read all the comments and replies. Yes, just click on the pink “click here” lettering and it will take you to the recipe. It is right above the last photo, in bold print. Do you see it? 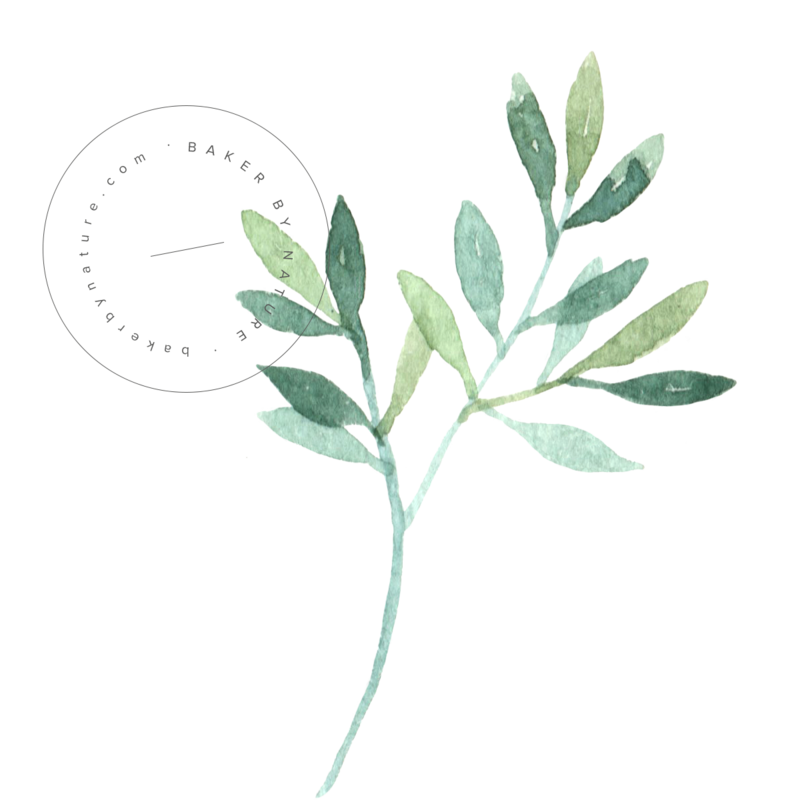 Trying to locate the link as well…will continue to look. I know you posted this years ago but I just had to comment, this is the best chicken soup recipe ever! Between the chicken seasoning, the dill and the lemon juice, it is just full of delicious flavor! I actually did not add any water, just used chicken stock and broth because anytime I add water it’s too bland for me, but after eating this I might actually use (a little) water next time. Thanks so much for this recipe! This soup looks delicious!! Flu or no flu, I gotta have it!!! Totally on board here, going to make your recipe. Sounds full of flavor and looks delicious! Looks amazing and I love that you added lemon and dill at the end! So hearty and delicious! We keep Chicken Noodle Soup on the ready during the colder months! Hi! I wanted to thank you for the wonderful recipe. My husband has a terrible cold and I have always heard chicken soup was good for that but I wanted something with a little more kick to it. Thank you! BTW, he loved it and so did I! I made this soup per instructions because we were feeling under the weather with aches and head congestion. After having a bowl, we started to feel better within minutes. The combination of spices helped and cleared our noses. We will be making this delicious soup each and every time we feel sick and also to have as a great winter soup. 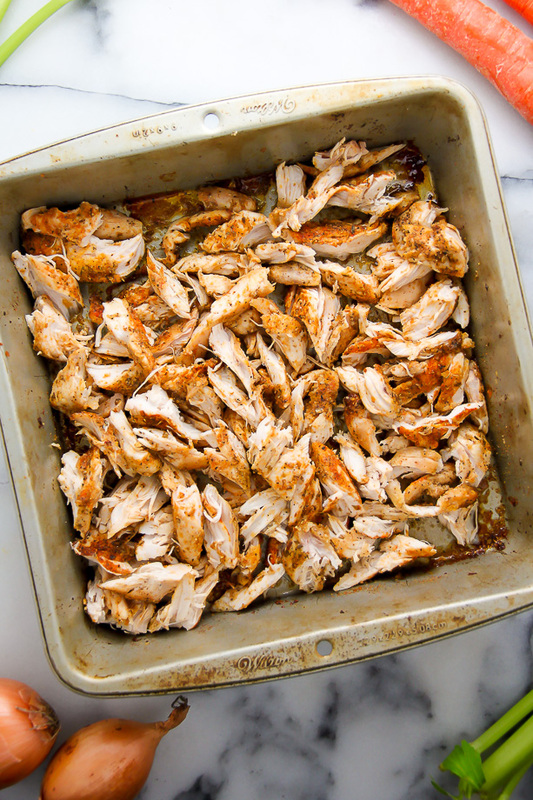 I want to try this recipe with Thanksgiving Turkey leftovers too. I just want to say…I’ve made this quite a few times and my family loves it! Its so good and we don’t wait to feel under the weather to make this! Thank you for the great recipe!!! This sounds like it’d be good without the noodles. We’re trying to cut back on grain and I’m not a fan of noodles anyway. What do you think about leaving the noodles out? I was thinking the same thing!! MYbe add a few more veggies? I don’t know. Hello! Are you supposed to cook the noodles before stirring into the broth mixture or do you let them cook in it instead? Just made this soup for my daughter and me. We’ve been sick with a cold :(. I love this soup!!! !this is my go-to chicken noodle from now on. Thank you for sharing! I made this for dinner last night (and for my brother who’s fighting a cold) and it came out delicious. I added more black pepper, chili powder and cayenne pepper to the soup for favor and kick! I love this soup!!! I’ve never tried dill in chicken soup, and you’re right, it is delicious! I added some frozen mixed vegetables for extra nutrition, and sprinkled parmesan cheese on top. SO GOOD, THANK YOU! Hi! This is great but really spicy! Anyway to dumb down after it’s made? Thx! How can i adapt to make in crock pot, without losing flavor? I have a sick daughter, so I made it. My husband and I liked it a lot, but it was too spicy for my kids. I didn’t even put the full amount of chili powder in it. If you don’t want it too spicy for kids, I’d reduce the cayenne and chili powder. Just curious how much you would suggest reducing the spices? I plan to make for my 3 year old to eat. He will eat things with some spices, but not too spicy. If you were going to freeze this could you do everything but add the pasta before doing so? Now I just need someone to cook it since I’m sick and have no energy! Looks good!! This is by far the best chicken soup I’ve ever had! I usually hate dill, but found it worked perfectly in this recipe. I made this a couple of weeks ago when I had the flu and it was the only thing I wanted to eat. Unfortunately I’m sick again, but I’ll be whipping up another batch of this soup to help get me through it. I had a major move earlier this week in the painful cold of winter. I’ve been SO sick the past couple of days and it seems like its only getting worse. I’ve been taking otc meds for a few days and nothing is working!! I came across this recipe, so I’m going to the store for the ingredients in a few minutes to try this out. Fingers crossed!! Thank you for this recipe, I am so excited to make this today. Can I sub rice for the noodles for a gluten-free option? I plan to just cook until rice is soft. Thank you! I’ve been in search for the perfect chicken soup and I’m ecstatic to say: “I found it”!!! Amazing recipe, thank you so much!!! This soup looks amazing and the bread looks great in these photos too. Do you have the bread recipe? I love this soup!! Today is the second time I have made it, and I’m going to put some in the freezer. I want to have on hand all the time!! This was my first time making soup. This recipe is delicious and easy to follow. My family loved it! Just made this soup today, it was super yummy!! I love dill and the lemon definitely wasn’t overpowering but enough to make it delicious!! My husband was sick so I made a pot of this wonderful soup. Just the right spices to clear his sinuses and fill his tummy. I added another small can of chicken broth and 3 cups of water. I also used frozen, pre-cooked chicken and it cut the time down significantly. Two yums up!! I was a little hesitant on this recipe just based off of the seasonings. I am SO glad I tried it!! The first time I tried it I had a sinus infection, the cayenne and chili powder opened me right up. I did add extra celery and carrots. Otherwise, I left the recipe as is (using gluten free noodles) and it’s amazing! Have made again, even when not sick. I have made this soup several times. I always double the recipe as I am feeding 5. Love the lemon and the dill flavor. Thanks for sharing. Best soup ever! Everyone loved it, even our super picky eaters!! My husband has been under the weather the last few days, so I Googled “Chicken Noodle Soup for my Sick Husband”, and this recipe popped up. I was concerned about the lemon and the dill, but we normally do not cook with those ingredients. However, my husband really liked it!. I didn’t have fresh dill, so I substituted one tablespoon of dried dill, and it was enough. The recipe didn’t mention putting the drippings from the chicken bake in the soup, so I didn’t include them. It was a shame to discard those good spices and juices. I thought about separating out the oil and adding the spices and left over juices into the soup. What is the correct answer, drippings in or no drippings? this soup is bomb diggety down rite awesome, I am now making it for the 4 time! Thanks so much for this recipe! love love love it!!! !